We are a small family guest house offering 5 very comfortable rooms to our guests. 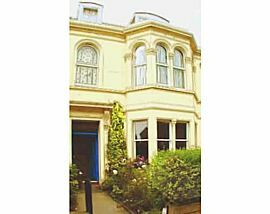 The house is a listed victorian townhouse built in 1856 and is part of a terrace of large properties. We are situated along a pleasant residential street about 1 Km from Princes Street (the main shopping street in Edinburgh) and Waverley train station. 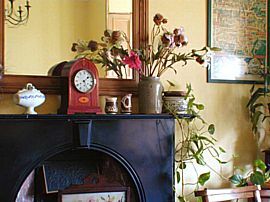 All our rooms are furnished with period furniture. 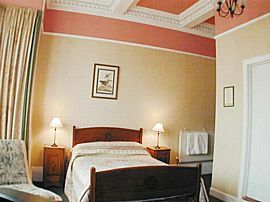 The largest family room has ensuite facilities (bath and shower), a large bay window and an ornate corniced ceiling. 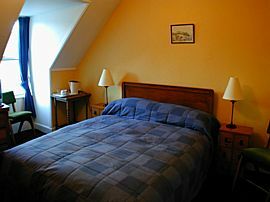 All rooms have colour TV, wash hand basin, tea and coffee facilities and central heating. There are two newly fitted bathrooms (with showers) located immediately outside our standard rooms. 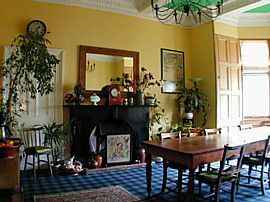 The breakfast room has a large black marble fireplace as a centre piece. The room itself has an ornate corniced ceiling, wide bay window and a large 10 foot antique mahogany table where you can enjoy breakfast while chatting with the other guests. In the morning, we offer: Orange juice, tea (including herbal or fruit teas), filtered coffee, a choice of cereals, prunes, grapefruit segments, and fresh fruit. The cooked option is a fried egg (free range) with bacon, tomato, fried mushrooms and baked beans. Guests may also choose to have a selection of cheeses with biscuits or simply good old fashioned porridge. Toast (white and / or wholemeal) is provided in each case. Special Diets Provision: Special diets are catered for. We cater for vegeterians. To come by taxi will cost just under £5 for the 5 minute trip, a taxi can take up to 5 people. To walk from the station will take between fifteen and twenty minutes - this can seem a long way if you are carrying heavy bags. To take a bus from Princess street, leave the station and turn right along Waverley Bridge, cross Princess St and walk up St David St. You will pass Jenners department store on your left. The bus stop is about 50m from Princess St along St David St. The bus numbers are the 10, 11, 12 or 16 . The fare is £1 each (you need the exact change) and ask to get off at Pilrig Church. Pilrig St is at the junction with the Church and you will find us 100m down Pilrig St on the left. A taxi from the airport to the Guest House will cost between £17 and £19. The airport bus single fare is about £3.50 and the return fare is about £5. The bus takes you to Waverley station near Princess St. From Waverley bridge, you can walk, take a taxi or bus it. From St Andrews Bus Station you can walk to the Guest House in about 15 minutes. Leaving the bus station ask for the direction to Leith Walk. Turn into Queen st and York Place and head for Picardy Place (a large roundabout) with a Warner Bros cinema complex on the far side. Bear to the left (towards the sea) down Leith Walk (the A 900), its the wide road with green bus lanes and a few small trees down the middle, you will see the Playhouse Theatre on your right across the road. Just keep walking down the left hand side of Leith Walk until you reach Pilrig church (Warning! Along Leith Walk, each junction has its own name). At the church turn left onto Pilrig St, we are 100 m on the left. Catching a local bus from St Andrews Square or York Place. Use numbers 10, 11, 12, 16. The fare is £1 (have the correct change, drivers do not give change on fares). You can also buy an all day ticket for £2.50. Follow all signs to the city centre. From the city centre, lookout for a road sign to the A 900, this is Leith Walk. Coming down Leith Walk from the city centre, you will see a church on your left (Pilrig church), Pilrig st is the turning before the church.